Ford’s AOD-E’s and 4R70w’s have more than proven what I started to preach about their durability and potential way back in the mid 1990’s. 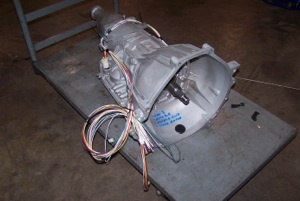 Without going into a whole bunch of technical detail on the insides of these electronically controlled 4-speed overdrives…. Basically if you don’t live under a rock, and if you’re into late model Mustang straight line performance and drag racing – I’m sure that somehow or another you will have noticed by now that AOD-E and its brother; the 4R70w 4-speed auto’s can very comfortably handle now days well over 700+ horsepower in front of them. This is with no serious internal hard part changes, just a good build-up and a good valve body tweak. Another thing that most will argue is that stick shift/manual trans cars are typically faster or quicker then comparably equipped automatic cars (straight line only of course)…. This is for the most part not true these days. Especially with the 5-speed auto’s, and more currently the 6-speed auto’s that have started to surface in many late model cars and trucks. These modern 6-speeds automatics and their tall first gears combined with closer ratios, and more “forward” non-overdrive ratios have really started to bridge the gap between stick cars vs. automatic cars. Generally if a stick car is much quicker than a comparably equipped auto car – the stick guy is most likely and typically working a lot harder (banging gears like a pro & missing shifts quite often too), and abusing the car a lot more to achieve the edge that he may have over an automatic car. And usually the only way the stick car will actually leap out way ahead of an automatic car is with a very high RPM clutch dump. This isn’t even possible without very sticky tires or slicks. 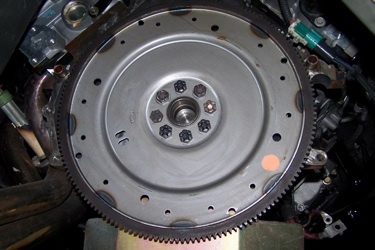 Where as an auto-trans car with the correct gearing and TQ converter can usually just be “punched” from a dead, and they are out and gone. And above all; the Auto’s are without a doubt always far more reliable and consistent then the stick’s in every way!! This tech article isn’t about the argument of which is stronger or faster although. I basically just want to write and illustrate a very up to date 4R70w conversion that is quite common at Alternative Auto Performance for the last nearly two decades now. For the guys looking to do this on the ’96 through ’04 Mustangs, it’s not to bad of a conversion over all. Many stock parts that are needed for the conversion are still available new from the dealer which is the way we prefer to acquire the parts (new). For the ’79 through ’93 Mustangs it can be a bit more challenging. 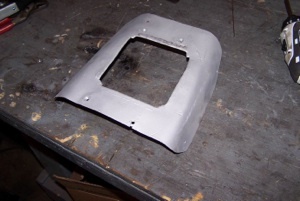 We even offer this conversion for the classic 1973 and earlier Mustangs and Fords too. 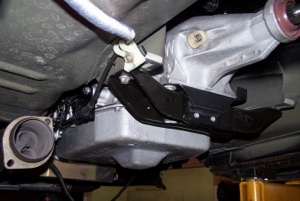 There is no correct transmission rear crossmember to accommodate the longer over all dimensions of a AOD-E/4R70w in the older FOX bodies and other classic Ford’s (nearly ¾ of an inch longer then old AOD’s, C-4’s, etc). So the stock Fox body trans crossmember needs to be moderately modified to make it fit and look correct. 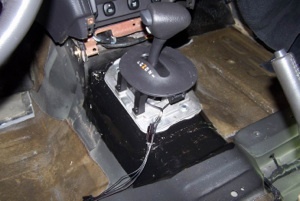 And stock AOD shifter assemblies have to be purchased “used” for the pre ’93 cars. Unless the car is already some sort of an automatic to begin with and your upgrading to the tougher more modern “E” trans. 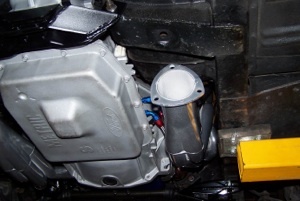 Then most stock shifters can be made to work with the more modern “E” automatic’s one way or another. Even in the Pre 1973 Mustangs. We’ve actually been able to make the stock 3-speed automatic shifters compatible with the newer 4-speed auto’s with overdrive. 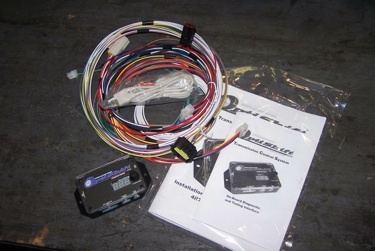 For the ’94 through ’04 Mustangs the AOD-E and 4R70w were an option, many stock parts will do the job. 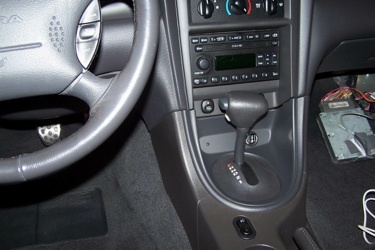 Although the part that can be quite a bit of work on all the AOD-E & 4R70w conversions ranging from ’79 to ’04; is the installation of the automatic shifter handle and base in the interior center counsel area of cars that were originally manual transmissions. At our facility we like do the conversions using only the stock shifter mechanisms on all the various years if possible. Because on all of our “E” conversions; all of the shifting is manipulated by a Baumann Electronic trans control box, there is no need for any form of a clunky, clanky, and poor fitting/poor looking aftermarket performance shifter. The only time the driver usually has to manually shift the trans; is to do a burnout which is started in manual 1st then shifted into 2nd to complete the burnout. After that the shifter is simply moved into the “D” position with the O.D. button pushed and disabled. Once the car starts moving forward the Baumann box will precisely handle all the shifts at WOT (and many other driving conditions) for you based on load and road speed. This leads to the most difficult part of these conversions. 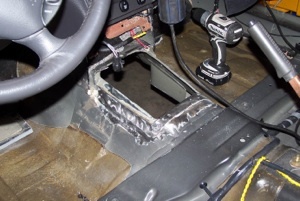 In order to make a stock auto shifter assembly fit in what was originally a manual trans center tunnel area – you have to cut away a raised mounting base, and add in a new base plate to effectively lower the area or mounting surface of where the automatic shifter base will mount to. 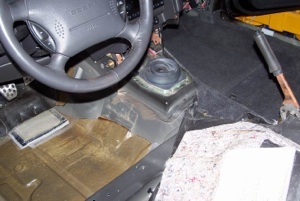 Most Mustang people may not be aware of this, but under the counsel and carpet on all Mustangs that we know of from ’04 back to ’79, Ford actually had a raised plate or hump in the tunnel if the car was originally a manual trans application. 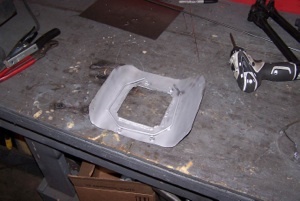 This raised plate’s spot welds need to be drilled/cut out-out, and then the raised up & humped section can be removed. 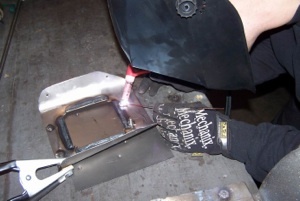 We then take a piece of what would normally be just flat sheet aluminum, or steal and cut out a properly sized hole in it so that the shifter arm can extend below it into the underside of the trans tunnel where the shift linkage cable will attach. We also slightly roll the new sheet metal to follow the contour of the tunnel, and fit it with mounting provisions for the new shifter base and handle. 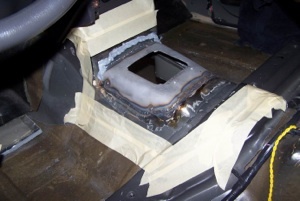 Then we finalize it by welding it in place, sealing and painting it. 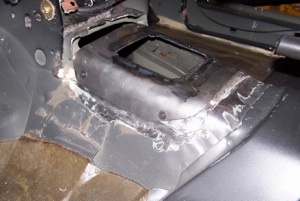 Once this is completed, a stock shifter assembly and base will bolt right in, and the remaining counsel and trim pieces will finish it off to have that OEM look to it as far as the interior is concerned. For our Automatic conversions we tend to use our own in-house built units by starting with good cores and then building from there. Depending on the level of power that the trans is going to see, it’s not imperative that the conversion 4R70w or AOD-E is a highly modified unit. We’ve found that if you power level is under 500hp you can actually get by with a good “used” trans. But this is providing that you do indeed come up with a low mileage un-abused unit that you can trust its history. Then with a simple shift kit installed with the Bauman controls (and even stock ECU controls with proper tuning), we find that “used” units like this can hold up quite well under 500hp. But on much more serious efforts we then get into the units and perform many more upgrades with the clutches, bands, and valve-body tweaks. 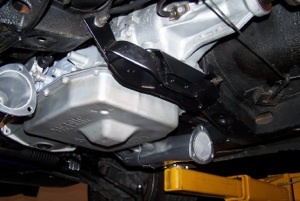 Underneath the car for the most part is pretty straight forward, especially if it’s a ’94 through ’04 Mustang. Most everything can be purchased new, especially for the more common ’96 through ‘04’s with modular motors. 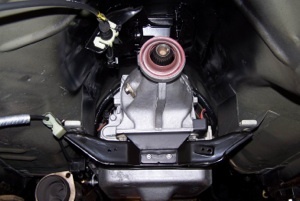 ’94 thru ‘95s had the longer AOD-E also, but where only produced for those two years with the old 302-351w small block trans bolt pattern — Making it a little more difficult to find both 302 bolt pattern cores and conversion pieces for the X-member too. But over all it’s not to bad on the ’94-‘95s and even the ’93 and older FOX body cars. 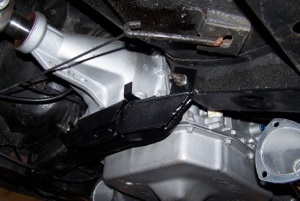 And just little bit of very useful info – if you’re having a hard time finding an AOD-E with the old 302-351w small block bolt pattern. You may want to note that the 3.8L V-6 Mustangs that were produced from 1994 all the way till 2004 were equipped with a 4R70w that had the old small block bolt pattern. This opens up to a much greater chance of coming up with one of the 302 pattern units that has been previously owned. The problem is the V-6 cores; they have to be gone through and built-up, and have a couple of upgrades done to keep up with V-8 horsepower at any level (they had fewer clutches in a couple of the clutch packs). 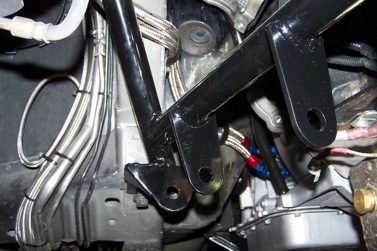 But this still opens the doors to not being limited to only AOD-Es from the short term ’94-’95 Mustang, and a few F-150 from ’94 to ’96 with the 302-351 bell housing bolt pattern prior to going with the modular trans bolt pattern from ’96 and up. 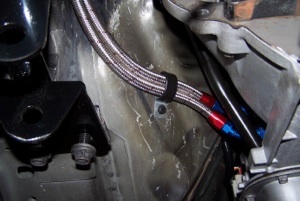 When it comes to the transmission oil cooler and the related provisions that go with it; we always tend to make our own lines with #6 braided line & a bunch of AN fittings to go with it, along with a very large and efficient trans oil cooler too. You could go with new or used production type steel hard lines. 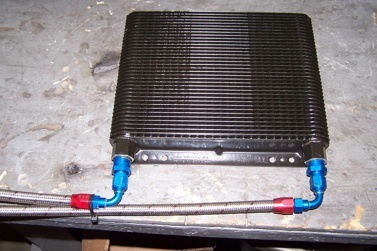 But we prefer to make and route them our own way into our own much bigger then stock type oil coolers. 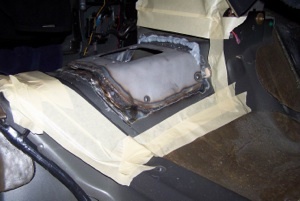 Stock lines are meant to be routed into the not so good “built-into-radiator-trans-cooler” provision. 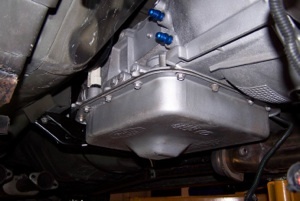 Many late model Fords do actually have a pretty good sized external trans oil cooler, but it’s still not as good as our larger aftermarket units. 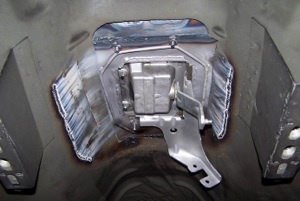 Especially when using a looser aftermarket TQ convertor which tends to produce more heat in the trans. When it comes to controlling these electronic automatics in a conversion environment, and even as an upgrade in some applications that are already equipped with an automatic trans, we only use the Baumann Electronics to do this as we’ve already mentioned earlier in this article. The Baumann boxes give us a very well designed electronic control box, and matching software to control shift feel and plot out a shift schedule for all driving styles and conditions. They’ve been around for over fifteen years and we’ve been using them since they surfaced back in the mid ‘90s. The Bauman box allows us to adjust shift feel by adjusting trans pressures, It allows us to adjust when to lock the TQ convertor for better economy and or better E.T. on very power full cars that can handle Lock-up at WOT. 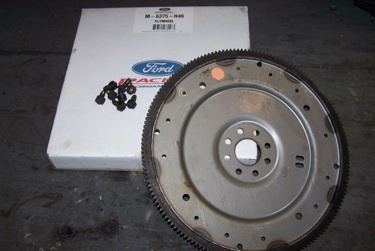 Ford’s AOD-E’s and 4R70w’s have more than proven what I started to preach about their durability and potential way back in the mid 1990’s. 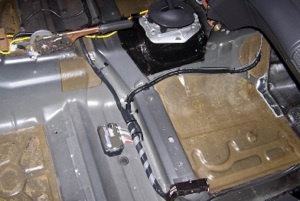 Trans Cooler Lines and Tube X-Member on ’03 Cobra. Previous: 26 Our Engine Building Capabilities! Next: 31 Our Nitrous Oxide Systems!